Again, cramped and too small for larger people. Fuel economy not as good as the CR-V, though the more powerful engine was the reason. The ride felt rather jarring, thought it was a manual transmission which could have contributed. The driving position, again, was very cramped and quite low. 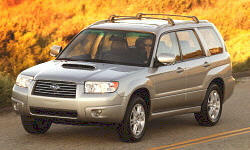 I had been used to driving a small Mazda sedan previously, yet I still felt low to the ground in the Forester.